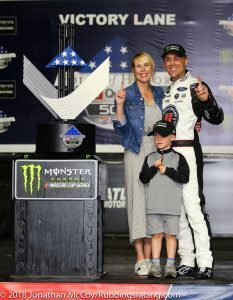 (via NASCAR Wire Service) – On Sunday night, after 17 barren years, Kevin Harvick finally completed the second chapter of his love affair with Atlanta Motor Speedway. In the Folds of Honor QuikTrip 500, the second Monster Energy NASCAR Cup Series race of the season, Harvick delivered a proper thrashing to the rest of the field, leading 181-of-325 laps and beating runner-up Brad Keselowski to the finish line by 2.690 seconds. Early in 2001, after Dale Earnhardt Sr. died in a last-lap crash in the Daytona 500, Harvick was thrust prematurely into a replacement role that would have cowed most rookies. Three weeks later, he notched his first Cup victory in a photo finish (.006 seconds) over Jeff Gordon. Harvick’s career victory total reached 38 on Sunday with his relentless performance at the 1.54-mile speedway, ending a frustrating drought that featured blinding speed foiled by ill fortune and inopportune mistakes. Afterwards, in his victory celebration, Harvick gave a “3” salute to Earnhardt, a tribute he had waited years to perform. Harvick had led the most laps in the last four Monster Energy events at Atlanta, but victory continued to elude him. Nor was the road to Sunday’s win free of obstacles. On Harvick’s second pit stop, after his No. 4 Stewart-Haas Racing Ford had dominated the race’s first stage, the air hose blew off the coupler of the pit gun wielded by the front tire changer Daniel Smith, and Harvick had to return to pit road to make sure his lug nuts were tight. No problem as Harvick restarted 16th on Lap 94 to begin Stage 2. On Lap 126, he passed teammate Kurt Busch for the lead. Denny Hamlin and Joey Logano tried divergent strategies, opting for a two-pit-stop strategy, instead of the typical three, over the last stage of the race. After Harvick came off pit road on Lap 289, Hamlin held a 1.819-second second advantage. Harvick brushed the ploy aside as easily as swatting a fly. On Lap 291 he passed Hamlin for the lead and took off. Ultimately, Hamlin finished fourth and Logano sixth. Harvick was out front by more than four seconds when Trevor Bayne’s engine blew in Turn 2 on Lap 297, trailing a thick cloud of smoke that covered the corner and left Daytona 500 runner-up Bubba Wallace driving blind into the back of Ricky Stenhouse Jr.’s Ford. On the subsequent restart on Lap 305, Harvick simply drove away, stretching his lead to nearly four seconds over the final 21 laps before easing up as he approached the finish line. “It was great getting into this race car and knowing that everybody knew that they had to beat our car,” Harvick said. “I’m just really, really happy with everything that we’ve done at Stewart-Haas Racing over the last five years, and this is a great start to getting ourselves in the Playoffs and doing everything that we need to do. SHR teammate Clint Bowyer finished third, putting Fords in all three podium positions. Martin Truex Jr. charged forward from a 35th-place starting position to run fifth. Logano, pole winner Kyle Busch, Kurt Busch, Kyle Larson and Chase Elliott completed the top 10. Logano took over the series lead by six points over Ryan Blaney, who finished 12th. Daytona 500 winner Austin Dillon was 14th, the first driver one lap down. Note: A post-race check revealed one lug nut unsecured on Harvick’s winning No. 4 Ford. The penalty guidelines in the NASCAR Rule Book call for a fine only. … The Stewart-Haas Racing No. 4, the Team Penske No. 2 Ford and the Joe Gibbs Racing No. 18 Toyota will go to the NASCAR Research & Development Center for further inspection this week.